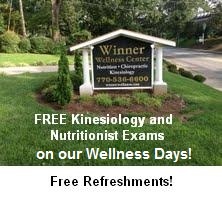 At Winner Wellness Center we know how challenging it can be to make healthcare choices. Our mission is to provide natural options for people looking for holistic alternatives to more traditional medicine. Our facility includes a kinesiology-based chiropractic clinic and a nutritional healing center with a fully stocked nutrition store. We provide a range of individualized, non-invasive treatments including cold laser therapy, allergy testing, hormonal balancing, acupressure, and emotional release. Our practitioners are passionate about providing the highest quality holistic health care for each of our patients. To aid you in discovering the choices that are right for you, we provide free consultations at our monthly Wellness Days.